AFRICAN AMERICAN REPORTS: Saying Ben Carson is not qualified to lead HUD is not racist. Saying Ben Carson is not qualified to lead HUD is not racist. By now you know that Ben Carson has been picked by Donald Trump to run HUD. 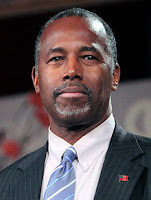 While Carson is a great neurosurgeon and a smart man he is in no way qualified to run HUD. Now some conservatives have starting calling the criticism of Carson's selection racist. How is that racist? I have no idea and neither do those spouting that nonsense. Listen to more below.